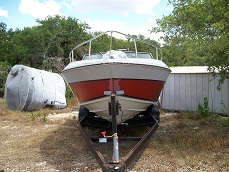 Austin Boat Forums › Lakes › Lake Travis › Who's going out this weekend? Re: Who's going out this weekend? Yeah it came down super hard and in sheets for about 30 minutes. Looks like some more today. Was going to join a buddy on his boat today but I think we're holding at the dock until the lightning goes away. I can verify the rain as I got soaked unloading stuff into our big shop because my dad does not believe in storage complexes. he thinks they are a waste of money but he also does not like the having all the stuff in the shop. I'm glad I missed this weekend. Didn't look good. Of course sitting in a truck for 49hrs wasn't fun either. At least it went smooth.